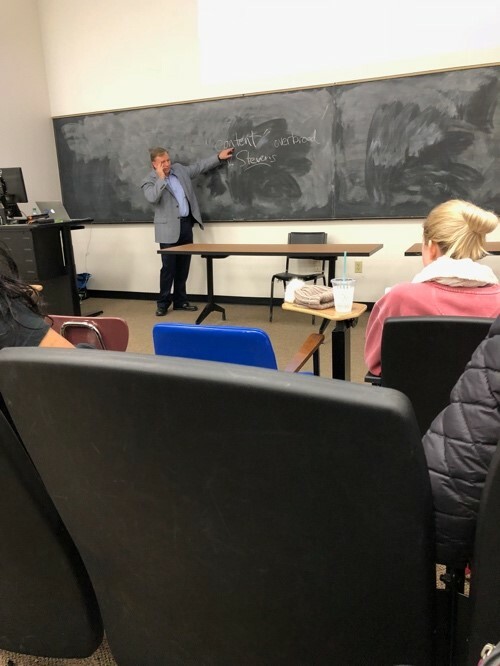 SAN MARCOS— Frank LoMonte spoke to students about freedom of speech and regulations on speech concerning students Tuesday during Mass Comm Week. 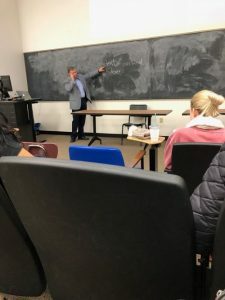 LoMonte, Professor and Director of the Brechner Center for Freedom of Information at the University of Florida, spoke during a Media Law class Tuesday morning in the Hines building. His lecture included several different examples of Supreme Court cases in relation to students both in K-12 and college. LoMonte worked at the Student Press Law Center for almost 10 years to protect the rights of student journalists. “You find out when you work on the rights of journalists, that actually the rights of all student speakers get implicated because when you pass laws, you pass rules to protect student journalism, you protect all speakers,” LoMonte said. LoMonte mentioned several different Supreme Court cases concerning free speech for students including: Hazelwood v. Kuhlmeier, Tinker v. Des Moines Independent Community School District and Dariano v. Morgan Hill Unified School District. Lindye Keating, a public relations student attending the event, explained that her favorite part of the lecture was LoMonte’s detailed accounts of the Supreme Court cases that affect not just student journalists, but also students everywhere. “I liked how detailed he got in all the cases and everything,” Keating said. Brynn McCurley, an electronic media and mass communications major, thought he was a good speaker that knew a lot about the subject. She mentions the fact that college campuses have not been talked about in regard to freedom of speech, but K-12 schools have. “My favorite thing he talked about was how college campuses have still not been discussed when it comes to free speech,” McCurley said. LoMonte’s lecture was one of two he is conducting on campus during Mass Comm Week, both concerned freedom of speech in relation to media law.